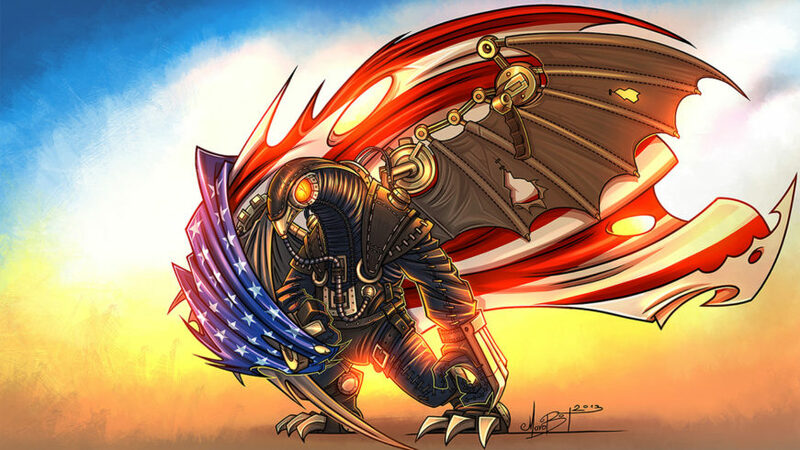 Hey guys,so, we’ve been playing this awesome, AWESOME game (I’m sure most of you would agree ;)) and after finally finishing it, I decided it would be super-cool if I drew a BioShock Infinite wallpaper starring Songbird. So – here it is. Feel free to download this wallpaper, leave a comment (all feedback is good!) and share with your friends. We’d greatly appreciate that. Thanks!! And just because we’re soooo curious – what did you guys think about BioShock Infinite? Did you like it? Good job! Reminds me of the Sly Cooper artwork style. already set as my wallpaper. great job! Awesome job, new SongBird wallpaper looks great. How long did it take you to draw that? Anyway, it’s awesome! PS. oops, sorry … I don’t know what happened :/ but it should work now – please, check and let me know if it’s ok. Thanks! well, we’ll just have to see what the DLCs bring to the table 🙂 I really hope they involve Songbird a little bit more in those, I really do! Alright! Outstanding job! Loved this one. *Bows respectfully* Cheers! You should totally upload it on deviantart!